Christo and Jeanne-Claude's The Gates, the eagerly awaited public art project coming to Central Park in February, has attracted tremendous attention from the media as of late. Inevitably, the race has now begun to find ways to profit from the project. From the City government to museums to hotels, everyone looks to be getting in on the act, restaurants included. But what's the dining angle on The Gates? It turns out to be saffron, of all things. The stigmas of the crocus sativus flower bear the color of the fabric that will hang and billow from each of the 7,500 gates being installed throughout Central Park. New York City’s restaurants are celebrating The Gates with inventive saffron dishes like Seared Diver Scallops with Saffron and Blueberry Pavlova with Saffron and Passion fruit. 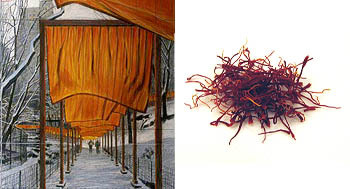 Saffron selections will be served at Bolo (23 E. 22nd St., 212/228-2200, www.bolorestaurant.com), Django (480 Lexington Ave., 212/871-6171), Josephs (1240 Avenue of the Americas, 212/332-1515, www.citarella.com), La Prima Donna Restaurant (163 W. 47th St., 212/398-3400, www.laprimadonnany.com) and Chelsea’s Finest Restaurants (www.chelseadining.com) including La Belle Vie (184 Eighth Ave., 212/929-4320) Mare (198 Eighth Ave., 212/675-7522), Tello's (263 W.19th St., 212/691-8696), Cuba Cafe (200 Eighth Ave., 212/633-1570) and Piccolo (226 Third Ave, 212/420-0600). Of course, should you choose to celebrate The Gates in the privacy of your own home, The Food Section recommends whipping up some saffron-infused Risotto alla Milanese. This recipe works great. 1. Chocolate Chat, finds answers to your burning chocolate questions by participating in a live, online chat with Dr. Robert Steinberg, co-founder of Scharffen Berger Chocolate Maker, Wednesday, January 26, 12:00 to 1:00 p.m. Free. 2. Trawler: A Journey Through the North Atlantic, travel writer and author Redmond O'Hanlon discusses his experiences aboard a Scottish deep-sea fishing trawler in the North Atlantic, Wednesday, January 26, 6:30 p.m. to 8:45 p.m., at The Explorers Club, 46 East 70th Street. $15/person at the door, first come first served, no advance reservations (212.628.8383). 3. Winter Restaurant Week, three-course lunches for $20.12 and three-course dinners for $35.00 (beverage, tax and gratuity additional) at participating New York restaurants, Monday, January 24, to Friday, January 28, and Monday, January 31, to Friday, February 4. 4. Hudson Restaurant Week, three-course lunches for $15.05 and three-course dinners for $30.05 (excluding tax, tip and beverages) at participating Hudson County, New Jersey restaurants, Monday, January 24, through Friday, February 4. 5. Uncorking Ancient Vintages, exploration of the history of wine (with tastings), led by chef Bill Yosses, Thursday, January 27, 7:00 p.m., at the American Museum of Natural History, Linder Theater, first floor, 79th Street and Central Park West. $15 non/members, $13.50/members, students, senior citizens (212.769.5200). 6. Food Culture in the Meiji Era: Japanese & Western Harmony, The Japan Society hosts a lecture on the development of an East-West "fusion tradition" in Japanese cuisine at the close of the 19th century. Participants include Noriko Yanagihara, Japanese food specialist focusing on the preservation of Japanese culinary tradition and Dr. Katarzyna Cwiertka of Leiden University's Centre for Japanese and Korean Studies (the Netherlands). Moderated by Elizabeth Andoh, lecturer and writer specializing in Japanese foodways and cultural affairs. The lecture (including reception and tastings) will take place on Tuesday, February 1, 6:30 p.m., at the Japan Society, 333 East 47th Street. $20/person, Japan Society members/$17 (212.752.3015). The nominations for the Fifth Annual Weblog Awards have been announced, and The Food Section is a nominee in the brand new category of Best Food Weblog (scroll down to find the category and vote). Coming on the heels of the Food Blog Awards, this is quite an honor. My thanks to all who nominated The Food Section, and my congratulations to fellow nominees TastingMenu, Simply Recipes, 101 Cookbooks, and Cooking for Engineers! The food blog entries don't end there. Chocolate and Zucchini, Noodle Pie, and Spiceblog are up for awards in the categories Best European, Best Asian, and Best Australian or New Zealand Weblogs, respectively. And Is My Blog Burning? has been tapped for competition in the Best Meme category. 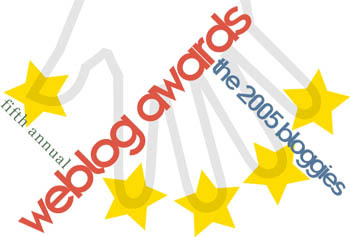 Head to the Weblog Awards page now and vote for your favorites. Voting continues through 10:00 p.m. EST on Sunday, January 31 Thursday, February 3. Another article about food blogs hit the newsstands yesterday. Mike Dunne's story in the Sacramento Bee ("Finger-clickin' good") is one of the more in-depth treatments of the food blogging phenomenon, providing a nice profile of fellow food blogger Elise Bauer in particular. Content: From his home in New York, Josh Friedland has his pulse on the global food scene, tracking new restaurants, celebrity chefs and breaking news stories in a manner timely and smart. Congratulations to all of the food blogs featured: A Full Belly, Simply Recipes, Becks & Posh, Chez Pim, Chocolate & Zucchini, Gastropoda, Saute Wednesday, Slice, The Amateur Gourmet, The Accidental Hedonist, and The Hungry Tiger! 1. A Growing Concern: Developing a Sustainable Food System for New York, chefs, farmers, activists, and educators will discuss issues around the development a sustainable food system for New York. The event, presented by Baum Forum and Continuing Education & Public Programs at CUNY Graduate Center, will take place on Saturday, January 22, 10:00 a.m. to 4:00 p.m., at The Graduate Center, 365 Fifth Ave at 34th St. $35 admission, $20/students (718.884.5716). 2. Winter Restaurant Week, three-course lunches for $20.12 and three-course dinners for $35.00 (beverage, tax and gratuity additional) at participating New York restaurants, Monday, January 24, to Friday, January 28, and Monday, January 31, to Friday, February 4. 3. Hudson Restaurant Week, three-course lunches for $15.05 and three-course dinners for $30.05 (excluding tax, tip and beverages) at participating Hudson County, New Jersey restaurants, Monday, January 24, through Friday, February 4. 4. Dine Out for Tsunami Relief, Monday, January 24, participating restaurants in New York and other cities will donate part of the proceeds from their business to tsunami relief efforts by Christian Blind Mission International. 5. First Annual Restaurant Industry Summit, The NYC Restaurant Industry Coalition will hold an event to present the 2005 Restaurant Industry Analysis, "a ground-breaking report on the state of the Restaurant Industry in post-9/11 New York City, and its implications on the City’s economic development, public health, and working conditions," Tuesday, January 25, 8:30 to 11:30 a.m., at Captain’s Ketch Restaurant 70 Pine Street (Corner of Pine & Pearl St.). Free (212.343.1771). 6. The History of Drinks in New York, "Food Maven" Arthur Schwartz will discuss the drinks of New York, presented by the Stony Brook University Center for Wine, Food, and Culture Tuesday, January 25, 6:30 to 8:00 p.m., at Stony Brook Manhattan, 401 Park Avenue South (at 28th Street). $85/person (631.632.9404). If your image of James Bond is based wholly on his screen persona, you might be shocked to discover a slightly more well-rounded character in the original books upon which the film series is based. This is not to say that you won't find the literary Bond consumed with the usual womanizing, extortion plots, spy gadgets, and corny puns. The secret agent is still a cliché, but on paper, he actually has an interior life. Well, almost. Take, for example his appetite. If you’ve seen only one James Bond movie, you know what the secret agent likes to drink (martinis "shaken, not stirred"), but what does he like to eat? 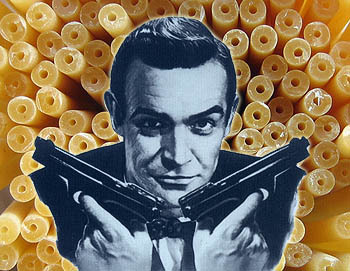 In Ian Fleming’s Thunderball (1961), Bond reveals a penchant for pasta that may be a surprise to those who are only familiar with his celluloid self. As the book opens, the secret agent has been ordered to spend two weeks suffering a numbing 1960s “nature cure” of strict dieting, sitz baths, and spine stretching at a retreat in Brighton called Shrublands. Bolognese and Chianti. Who knew? And here I thought the man existed solely on cocktails! On a sunny Sunday in early October of last year, the corner of Orchard and Broome was transformed into the epicenter of international pickling. 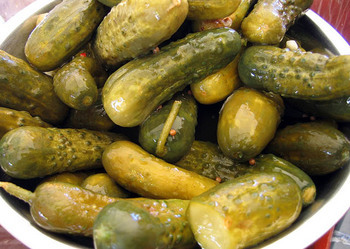 The occasion was the Fourth Annual New York City International Pickle Day, presented by the New York Food Museum and the Lower East Side Business Improvement District. A wide spectrum of the pickling arts were on display (and for tasting) -- from the traditional garlic and vinegar brines of Guss’s Pickles to the modern stylings of pickling newcomer Rick Field and his Rick's Picks (more on him here), not to mention Korean kimchi and chocolate pickles. Special thanks to Melissa Waldron Lehner for all of her hard work on this project. Winter Restaurant Week, three-course lunches for $20.12 and three-course dinners for $35.00 (beverage, tax and gratuity additional) at participating New York restaurants, January 24 to 28 and January 31 to February 4. 1. Spicy Club Indian, dinner with wine pairing presented by Johnny Tastebuds Urban Wine Adventures, Thursday, January 13, 7:00 p.m., at Gandhi Indian Restaurant, 345 East 6th St., between 1st and 2nd Avenues. $50/person, advance reservations required (212.255.7191). 2. Origins of Cooking, Daphne Derven, archaeologist and Stone Barns Center Director of Programs, discusses her research into the origins of cooking and signs copies of 70 Great Inventions of the Ancient World, Sunday, January 16, 2:00 to 3:00 p.m., at the Stone Barns Center for Food and Agriculture, 630 Bedford Road, Pocantico Hills, New York. Free (914.366.6200). 3. The Wine & Food of 17th Century Jewish Mystics: How to Feast like an Ancient Kabbalist, the Culinary Historians of New York presents a discussion and tasting led by Alan Brill on the ceremonial foods of the Kabbalists, Tuesday, January 18, 6:30 p.m., at the Jewish Community Center, 334 Amsterdam Ave. at 76th Street. Members/$25, guests/$30 (212.334.4175). NEW YORK, Jan. 7 -- The results are trickling in for the 2004 Food Blog Awards, and I am pleased to announce that The Food Section is a winner in the category of Best Food Blog - Food Industry. A special thanks to Kate at the Accidental Hedonist for putting all of this together, and thank you to everyone who voted for this site in such a competitive category. Among my worthy co-nominees, I'd like to single out Bruce Cole's Saute Wednesday for some overdue acknowledgment. Saute Wednesday was probably the very first independent food Web site I ever read (before The Food Section was even a glimmer in my flat screen monitor), and, ultimately, it served as an inspiration for the creation of my own site. So, thank you Bruce, and my congratulations to all of the other food blog award nominees and winners! 1. Festival of Kings, Gavroche restaurant is serving Galette des Rois, the French dessert traditionally served on the day of Epiphany (January 6). According to custom, he or she who finds la fève, a china figurine hidden inside the almond cream-filled cake, becomes King or Queen for the day. The cakes are available for dessert (or pre-ordered for take-out) during the week of the Epiphany, January 3 through January 9, at Gavroche, 212 West 14th Street (212.647.8553). 2. French Women Don’t Get Fat, Mireille Guiliano, CEO of Cliquot Inc., discusses the “French paradox” and reads from her book, French Women Don't Get Fat, Thursday, January 6, 7:00 p.m., at Florence Gould Hall, 55 E. 59th Street (between Park and Madison). Presented by the French Institute Alliance Francaise. $12/members, $18/non-members (212.307.4100). 3. New York City Chefs on How New York Eats, chefs Alfred Portale, Michael Lomonaco, and Dan Barber discuss the New York food scene, Sunday, Jan 9, 7:30 p.m., at the 92nd Street Y, 92nd Street at Lexington Avenue. $25.00/person (212.415.5500). 4. Disaster Relief from Behind the Stove, five-course dinner featuring dishes from chefs Patricia Yeo, Floyd Cardoz, Anita Lo, Pino Maffeo, Jehangir Mehta, and Michael Reid, Tuesday, January 11, 7:00 p.m. cocktails/8:00 p.m. dinner, at Sapa, 43 West 24th Street. $125/person (212.929.1800).